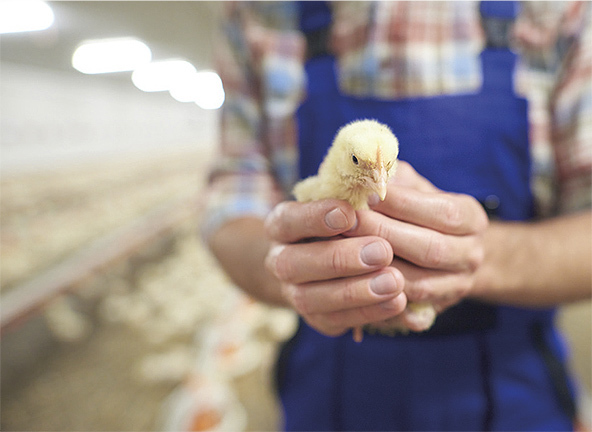 Over the last 30 years, poultry has been the fastest growing sector in animal production. Modern production, genetics improvements, nutrition requirements knowledge, change in antibiotic use, global trade of ingredients, consumers new requirements, accessible economical protein source for humans, all have shaped the industry towards new practices. Coccidiosis, necrotic and bacterial enteritis remain the most important concerns in today’s poultry production. This has challenged all involved – nutritionist, veterinarians, producers – to upgrade, update their way of doing things and pave the ground for exciting new emerging solutions relying less on medication. Chicks can travel from hatcheries or are hatched within the producer’s flock. Either way, we want to optimally support the chicks with a strong start in life. A healthy chick has a healthy gut. This is a key contributor to ensuring the bird’s growth and development. Thanks to many generations of selective breeding, today's chickens can lay eggs almost on a daily basis. Multifunctional feed supplements have beneficial effects on the efficiency of egg production and the actual quality of the egg. The production of Turkey meat has become more efficient in the past years thanks to improved nutrition quality and better technologies. The global trend to reduce the use of antibiotics means that having cost effective antibiotic alternative strategies is essential to a long term sustainable turkey production.